Fishing for stripers is the most prized sport fishing day ever! We are the premier sport fishing charter business from Green Harbor Marina in Marshfield, MA. From Boston to Cape Cod, we offer the best in Cape Cod deep sea fishing. Green Harbor, located just south of Boston, is easy access from Route 3, Exit 12, in Marshfield, MA. 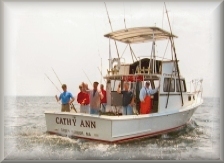 Cathy Ann Charters is a full-time sport fishing charter business operating since 1983, located at Green Harbor Marina, Marshfield MA. We have been sport fishing Cape Cod Bay, Stellwagen Bank, and beyond for many years and we provide the best in striped bass, blue fishing, and cod fishing as well as tuna and shark fishing. We do it all from Green Harbor, Marshfield, MA.! We offer personalized sport fishing charters. We are in the sport fishing charter business, not in the booking business. When you book Cathy Ann charters, you go fishing on the Cathy Ann with me, Captain Dave Patry. No one takes care of you like an owner/operator. We boast a 95% repeat sport fishing customer business. 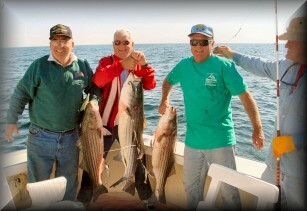 Yes, we do it all: cod fishing, striped bass and blue fishing, shark and tuna fishing from Boston to Cape Cod.